Take advantage of our tax free weekend and support local artists during our special Holiday Market on Saturday, November 15th from 11am – 3pm, part of our Holiday Gift Show. 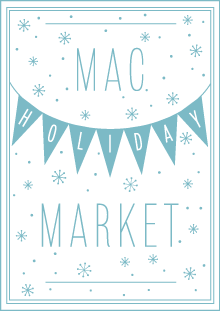 A new event for us this year, the Market will feature music, Munchies Food Truck, NORA Cupcake Truck, cocoa and cookies, and a family friendly craft. The Holiday Gift Show includes items such as: hand carved wooden spoons, bowls and cheese boards, jewelry, upcycled mirrors, chalkboards and frames, sailor bracelets, paper trees, wooden bowls, stoneware pottery, notecards, fiber items, natural soaps/balms, stained glass, hats, silk scarves, neckties, ceramics and fine art. Support local artists and artisans and give something special to your loved ones this holiday. Paige Luethy – crocheted hats, scarves, earwarmers, etc. Treefort Naturals – handcrafted soap, etc.